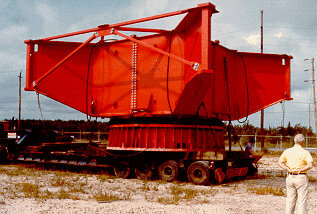 In a very unusual case this tower crane was moved substantially pre-assembled from New Jersey to New Hampshire. At the expense of a costly Barging Operation, the user made valuable schedule and labor cost gains. Normally the Rotating Base, which weighs well over 100 T, would be assembled piece by piece right on the Footing.